A successful small business has to be all about the customer. Your products and services have to offer real value to the customer, and the customer experience should be great. When you are doing those two things, it gets easier to get that one more customer that you need to make it. 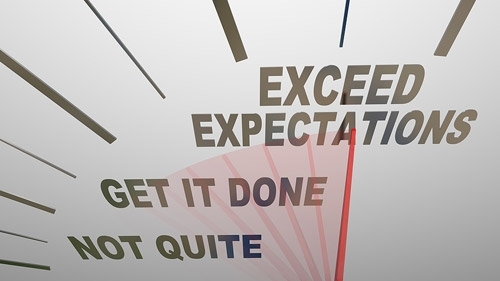 But key to that great customer experience is managing customer expectations. When a customer has a bad experience with your business, it has major consequences. To start, that person is less likely to return and do business with you again. And he or she can tell others, and social media and the Internet give an amplified voice to real customer feedback like that. And where there’s one unhappy customer, who knows how many others there are! One of the most common reasons customers are dissatisfied with a business is that they don’t know what to expect from the business. Put yourself in the customer’s shoes. If you don’t know exactly what it is this business does, what it is offering you, it becomes harder to come away happy. It becomes very easy to see the things that were not done, as opposed to the things that were. And how do you put a price value on work that you don’t completely understand? It is very hard for the customer to feel like he or she got great value. For example, your company might be built around unmatched experience and expertise, or great customer service—and you have built those into the price. But if the customer doesn’t understand the value that those factors add, then all they see is the same service at a higher cost. That’s a recipe for a bad customer experience. Make sure your customers know what to expect. They should understand the problem they have as well as the solution that you offer—and all the things you will do for them. To do this, you have to have real contact with the customers, especially for an ongoing service. Explain what you will do, let them know what you’re doing as you do it, and summarize what you’ve done afterwards, as well as any follow-up services you provide. You have to close the loop of people either not knowing what to do or what exactly you are doing for them. And when you close that loop so that people do understand your business and know what to expect, they are more likely to be satisfied with the service and your work. And satisfied customers will come back more often to buy more, and bring more people with them.